A 100-Year Old, "Japanese Christian's Criticism;" Still A Relevant Lesson From Yesteryear? Recently I was loaned a copy of an old E. Stanley Jones book that a friend found in a used bookstore. Its pages were somewhat tattered and its cover worn and seasoned; a testament to its longevity, no doubt. As I began reading this classic, I discovered tucked away in its pages a newspaper clipping from a Toronto newspaper, dated May 7, 1925. Wow, I thought; this is just eight years shy of being one hundred years old! As Individuals, Citizens of the Civilized Nations May Practice Christianity, but as Nations They Are as Brutal as Wild Beasts, Says Toyohiko Kagawa. In the earlier days of evangelical activity in the Orient, missionaries pointed to their home lands as examples of Christian piety and uprightness that the nations of the East might well emulate. But the militarism and commercial exploitation that have too often dominated the policy of the Western nations towards the east have had their logical effect and Christian converts are asking, quite naturally, why the Western Christians practice so little of what they preach. 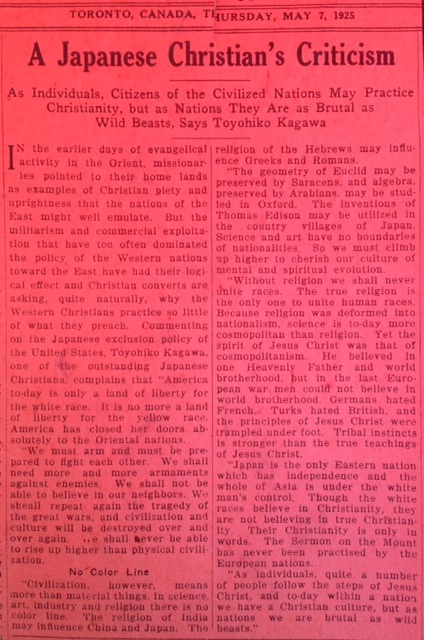 Commenting on the Japanese exclusion policy of the United States, Toyohiko Kagawa, one of the outstanding Japanese Christians, complains that "America to-day is only a land of liberty for the white race. It is no more a land of liberty for the yellow race. America has closed her doors absolutely to the Oriental nations. "We must arm and must be prepared to fight each other. We shall need more and more armaments against enemies. We shall not be able to believe in our neighbors. We shall repeat again the tragedy of the great wars, and civilization and culture will be destroyed over and over again. We shall never be able to rise up higher than physical civilization. "Civilization, however, means more than material things. In science, art, industry and religion there is no color line. The religion of India may influence China and Japan. The religion of the Hebrews may influence Greeks and Romans. "The geometry of Euclid may be preserved by Saracens, and algebra, preserved by Arabians, may be studied in Oxford. The inventions of Thomas Edison may be utilized in the country villages of Japan. Science and art have no boundaries of nationalities. So we must climb up higher to cherish our culture of mental and spiritual evolution. "Without religion we shall never unite races. The true religion is the only one to unite human races. Because religion was deformed into nationalism, science is to-day more cosmopolitan than religion. Yet the spirit of Jesus Christ was that of cosmopolitanism. He believed in one Heavenly Father and world brotherhood, but in the last European war, men could not believe in world brotherhood. Germans hated French. Turks hated British, and the principles of Jesus Christ were trampled under foot. Tribal instincts is stronger than the true teachings of Jesus Christ. "Japan is the only Eastern nation which has independence and the whole of Asia is under the white man's control. Though the white races believe in Christianity, they are not believing in true Christianity. Their Christianity is only in words. The Sermon of the Mount has never been practised by the European nations. "As individuals, quite a number of people follow the steps of Jesus Christ, and to-day within a nation we have a Christian culture, but as nations we are brutal as wild beasts." Have we learned anything since then? Are we any better, or is it pretty much business as usual? I wonder. Hmm. Do Christians today still struggle practicing what they preach? Hmm. Perhaps ironically, fourteen years after this was written, the world did once again begin to fight each other, and WWII had its genesis. Are we destined to prove once again just how little we've learned from history, and embark on another global military campaign? Are we dangerously perched on the eve of WWIII? Hmm. Are more armaments against enemies really the answer? It would seem that some politicians think so, but are they really what our hope should rest upon? Hmm. The author writes, "Civilization, however, means more than material things." Have Christians today also fallen victim to the god of materialism? If so, does that not make us polytheistic at best, and outright heathen hypocrites at worst? Hmm. Has Christianity become, perhaps, more "Nationalistic" than the type of Christianity that Jesus promoted? If so, what are you and I going to do about it? Hmm. As Christians, what do we believe about "brotherhood?" No, seriously. This also begs the question, at least for me, about how well we "love" our enemies. Do we "love" our enemies? Really? If not, then why not? Did we not get Jesus' memo about this? Or would we sooner continue justifying ourselves in our hatred for our fellow man? Hmm. Well there you have it. Feel free to comment on any one (or more) of those questions. I'd love to hear your thoughts. Peace and blessings to you and yours.